By combining Giemme System experience and the most advanced roofing and gazebo building techniques, GM Morando designs and creates conservatories. 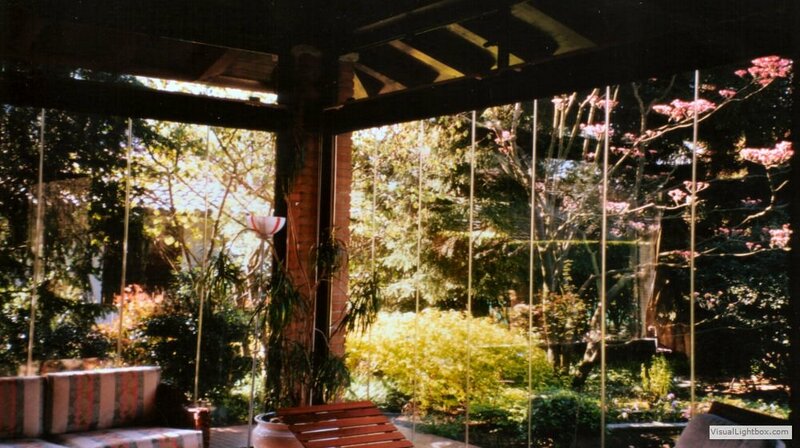 We propose all glass structures to create spaces with maximum brightness. The roof can be made in aluminium and glass (fixed or opening) for modern designs or with wooden beams to adapt to a more classic or rustic style. Often a conservatory can be made by simply closing off an already existing pergola or porch allowing you to make use of additional space. If you install the Giemme System to close off the perimeter wall, you can enjoy maximum flexibility of the folding doors that open up completely and allow you to stay in touch with the garden in the summer months. Gazebos and conservatories can also be produced on terraces where they are a precious element for apartments and penthouses. The environment thus created can be heated and air conditioned or not, depending on the individuals’ needs. In some cases, on balconies and terraces, a conservatory can be derived from the production of a solar greenhouse. This improves the overall condition of the buildings’ energy and by conforming to local regulations you can enjoy tax benefits in terms of recovery of surface area and volume. The resulting conservatory becomes a real patio area. 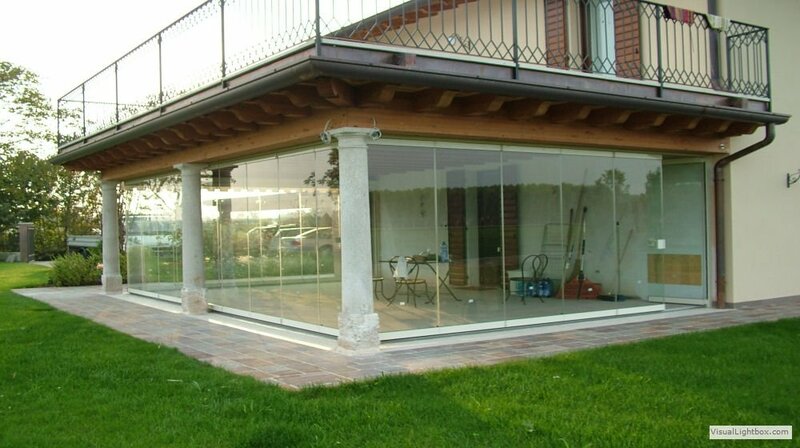 GM Morando produces conservatories and gazebos for restaurants, hotels and bars where even closing off the existing pergola becomes the ideal extension of an indoor room. 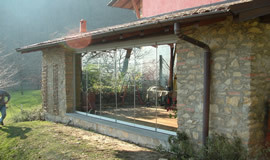 In the photos below you can see examples of verandas with iron frames. In the photo above left the fixed single pitch roof is made with galvanised iron joists to support opaque panels complete with flashing and guttering. Alternatively the conservatory can have a roof with joists in aluminium and glass made from 8mm tempered reflective +12+Visarm 55.1 (for detail see photo on the right). 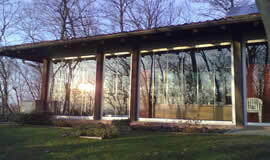 The panes of glass can be made to open or be fixed. A solution often requested by bars and restaurants is that of a gazebo structure. This consists of a fully opening upper awning structure with a perimeter closing folding doors which enables you to enjoy maximum flexibility. 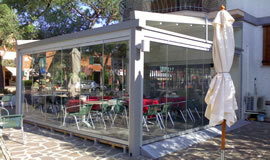 In fact this option was chosen by a bar on Lake Garda where the Giemme System was installed on an existing awning. The folding glass doors were installed with a side entrance door complete with lock, handle and door closer as for an entrance to premises. 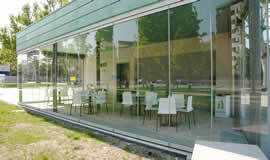 The glass doors fold up to the mounted side. Also available without floor guide rail. Can be opened internally or externally. Also available without a floor guide rail up to a maximum of 7 panels (4 at one side 3 at the other). Door comes with lock and handle in aluminium. Can be opened internally or externally. 3D is folding glass doors composed of 6 panels with a centrally opening entrance door. Corner made without mounts and with magnetic seals. It allows you to fold up the doors to a single point. Thanks to the curved floor guide rail, the doors can glide around the corner from one side to the other folding up with the other doors. Can be opened internally or externally. 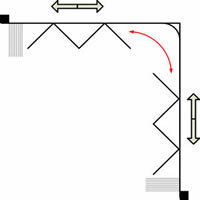 Only available with external or recessed floor guide rail. In the picture on the right the front doors can pass around the corner and fold up against the wall taking up minimal space. Underneath is the alternative solution made with a tubular profile and aluminium mounts.